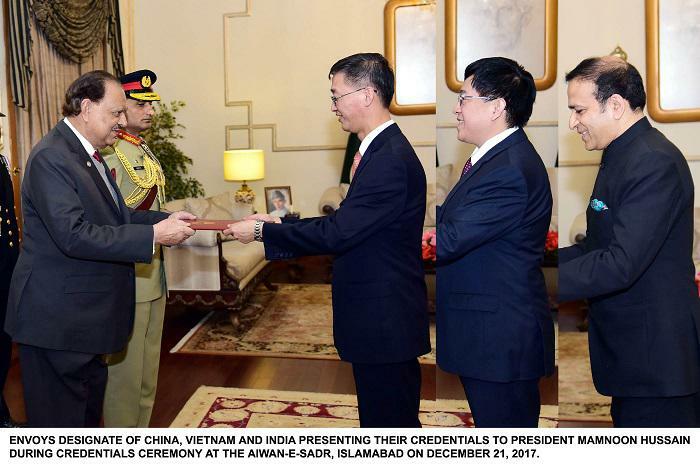 After arriving in Pakistan, the envoys-designate of China, Vietnam and India have presented their credentials to President Mamnoon Hussain in a ceremony held at the Aiwan-e-Sadr in Islamabad. Ambassador of China H.E. Yao Jing, Ambassador of Vietnam H.E. Pham Hoang Kim and High Commissioner of India H.E. Ajay Bisaria were the envoys who presented their credentials. During the separate meetings with the envoys, the president said that Pakistan desired to further enhance bilateral relations with all friendly and neighbouring countries for peace, stability and prosperity in the region. He underlined that the landmark project of China-Pakistan Economic Corridor (CPEC) would not only result in the progress and development of Pakistan and China but it would also be a game-changer for the prosperity of the entire region. President stated that the policies and initiatives taken by the incumbent government had resulted in strengthening the economy of the country. President Mamnoon underscored that Pakistan offered great investment and business opportunities, and international investors should avail these by investing in different sectors. The president felicitated the newly appointed ambassadors and a high commissioner to Pakistan, hoping that they would work to further strengthen the bilateral ties of their respective countries with Pakistan. Newly appointed Chinese Ambassador Yao Jing has replaced Mr. Sun Weidong. The new Chinese Ambassador to Pakistan Yao Jing said the CPEC had achieved tangible results leading to a new economic miracle. New Indian High Commissioner to Pakistan Ajay Bisaria said his country was sincerely working towards regional peace, stability and development. Bisaria exchanged views on different issues of bilateral importance. Bisaria’s immediate challenge will be to handle the case of Indian spy Kulbhushan Jadhav as India is hopeful that the former Indian Navy officer sentenced to death by a Pakistani military court, would be released.